LA executive car rental comes in many different flavors. You can rent an executive car often referred to as luxury, a large 15-passenger van that will accommodate the entire staff, or you can even hire a chauffeur for many different vehicles. The major LA executive car rental agencies include Rent in Style, Hummer Limo LA, and Executive Van SUV Rental. Of course, you can always rent luxury cars from such major rental care agencies as Budget, Dollar, and Enterprise. Rent in Style LA executive car rental offers various services including hourly and daily rental. They offer a large fleet of vehicles that will provide you with the LA executive car rental you need for getting around Los Angeles. This company breaks their vehicles into four categories including performance, SUV’s, Exotic, and chauffeured. In the performance group, you will find such deals as a Porsche Turbo S convertible for $995 per day or the Porsche Panamera for a daily rate of $595. The SUV’s they offer include Range Rover Evoque for $595 per day and the Cadillac Escalade ESV for $350 per day. In the exotic group, you will find the Ferrari 458 Italia with a daily rate of $1,995, Lamborghini LP640 for $2,495 per day, Mercedes SLS $1,995 daily rental, Ferrari California $1,595 per day, Lamborghini Spider with a daily rate of $1,595, Bentley GTC for $1,495 per day, and the Audi R8 Spider $1,495 per day. If you want to have a chauffeur, the company offers a RR Ghost for $395 per hour, Rolls Royce Phantom for $395 per hour, Maybach with an hourly rate of $2,095, and a black Mercedes S 550 for $495 per hour. For those that truly want to experience the feel of being pampered a Hummer Limo LA executive car rental may be the right choice. Of course, since you will have a chauffeur you will not be driving all around town, but will have your own personal chauffeur. Prices for vehicles are not included on their website. 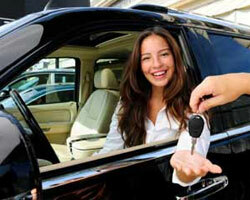 This company offers a variety of vehicles for your LA executive car rental. A few of the vehicles you will find here include Ford Explorer, Full Size SUV, Mustang, Convertibles, passenger vans, full size conversion vans, cargo vans, mini-vans, 15 passenger vans, 12 passenger sprinter van, along with economy car rentals such as the Toyota Camry, Toyota Corolla, and the Chrysler 300. An example of the prices includes Toyota Sienna minivan for $120 per day, Ford Explorer SUV for $140 per day, and the Ford GMC cargo van for $140 per day.